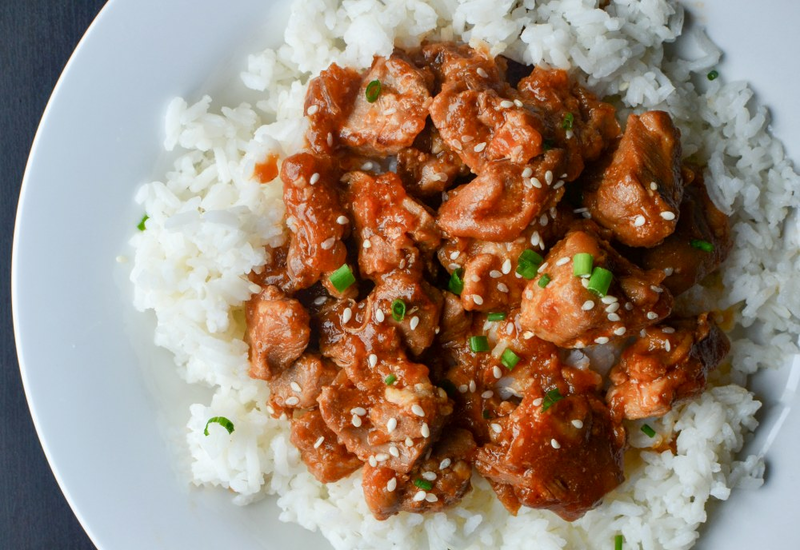 This pressure cooker version of the Chinese restaurant classic cooks chicken in an incredible garlic-soy sauce for a delicious dinner in about 40 minutes. There's no need to order take-out when it's so easy to make this recipe at home! Plus, clean up is just as easy because this is a one pot dish. Serve it over rice or spiralized vegetables to round out the meal. To make it a fun experience for the whole family, you can even buy some fortune cookies to open and enjoy after dinner. Heat oil in a pressure cooker set to Sauté. Working in batches, sear chicken in oil until golden brown, about 3 minutes per batch; remove browned chicken to a plate with a slotted spoon. Mix soy sauce, garlic, red pepper, and sesame seeds together in a bowl. Return chicken to pressure cooker pot; add sauce and stir to coat. Seal lid on pressure cooker, turn steam vent to Sealing, select Poultry, and cook on High Pressure for 5 minutes. Immediately turn steam vent to Venting to Quick Release pressure. Press Cancel on pressure cooker and set to Sauté. Whisk cornstarch into water in a small bowl to dissolve; stir into the chicken mixture and cook until the sauce thickens, about 2 minutes. Ladle chicken and sauce onto plates; garnish with green onion and additional sesame seeds to serve. This recipe features both sesame oil and sesame seeds. Both impart a rich, nutty flavor that makes this dish so distinct and delicious. Per Serving: 339 calories; 18g fat; 3.6g carbohydrates; 43g protein; 208mg cholesterol; 1178mg sodium. Easy, fast, delicious, and kid-friendly. Can't ask for more than that, especially during a crazy week. Fantastic. I really liked this sesame chicken! I didn't serve it with rice, though, I used noodles. The sauce was easy and fantastic. This is the perfect weeknight meal. I really loved this sesame chicken, especially the sauce. It was really quick to make in the pressure cooker too. I gave it to the kids, and they loved it. If you want a thinner sauce, use 1 teaspoon cornstarch instead of two. So delicious, especially with brown rice. The recipe was easy to follow and turned out well. It was a little spicy and I added a teaspoon of honey. I might add a little more next time. I didn't add sesame seeds, but still enjoyed the rich flavor of this dish. This paired great with spiralized zucchini noodles. Received my MultiPot today and have already tried this recipe. My husband and I both loved it! I altered the recipe slightly and reduced the crushed red pepper to 1/2 tsp., and added a generous teaspoon of minced ginger. I think the recipe should also have called for a bit more liquid. On the whole, a very good dish and we enjoyed it thoroughly!